It’s amazing how quickly things can change. Just four years ago when Stanford beat USC, 24-23, with a touchdown in the closing seconds it was a monumental upset. USC was one of the top teams in the country, and no one could remember when Stanford had been even remotely relevant. The game was viewed as so one-sided that USC was favored by 39 points -- an almost unheard of spread in a game between major conference opponents. That was 2007. Now in 2011 USC isn’t eligible for the postseason, but Stanford certainly is. The best player in the country plays in Palo Alto, and his team appears at this point to be headed back to the BCS for the second year in a row. Stanford is in the midst of one of the biggest turnarounds we have seen in a program recently, and that win in 2007 was a big catalyst for their resurgence. Every time the Cardinal take the field there is one storyline that gets all the attention -- Andrew Luck. The quarterback is widely viewed as the best NFL quarterback prospect we have seen in years -- perhaps since Peyton Manning. He is in the midst of another very strong season -- 72 percent completion rate, 9.35 YPA, and 20 touchdowns with just three interceptions. The most impressive display of his power, though, came last week against Washington. The Huskies were a solid defensive team against the run coming into the game. They were just terrified by what Luck could do, though, and they refused to let him beat him through the air. No matter how much Stanford ran the ball, the Huskies wouldn’t commit totally to defending the run because they feared Luck would then beat them through the air. In the end Luck had reasonably pedestrian numbers for him -- 169 yards passing and two touchdowns. The Cardinal ran the ball 44 times for 446 yards, though -- an impossibly strong average that was made possible because of the fear of Luck. The Trojans have lost to Luck both times they have played him, so they know just how scary he can be. That fear factor is definitely part of the story here. While Luck gets all the accolades, it’s important to remember that the Trojans have a very nice QB of their own. Matt Barkley has thrown for more yards than Luck, and his 68 percent completion rate and 19/4 TD-to-interception ratio is only a hair behind. What really stands out for Barkley is the chemistry he has with receiver Robert Woods. That could be an issue this week, though — Woods is dealing with injuries that have limited his practice time, and he could be below his best on Saturday. While Luck is special, it does a disservice to the Cardinal to say that this team is all about him. A team can’t be as dominant as this one has been without strength all over the field. They are the only team in the country that is a perfect 7-0 ATS. They have won every game by at least 26 points, and they are only giving up 12.5 points per game. This is a dangerous team on both sides of the ball that has a very real look at a national title if they can stay on track. 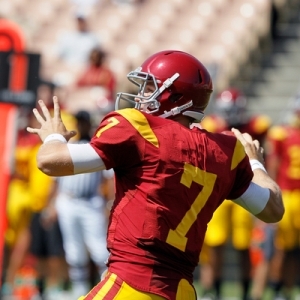 This is a lost season for the Trojans, but they aren’t playing like it. Their scary opening effort against Minnesota was a concern, and the loss to Arizona State was ugly. However, they have shown improvement in recent weeks, and their win at Notre Dame last week was decisive. Their 6-1 record might be a bit flattering, but this is a dangerous, talented team. There is some interesting line movement in this game. The action is heavily tilted towards the Cardinal — nearly 90 percent of bets have been on Stanford. Despite that the line opened with Stanford favored by 8.5 and has fallen to 7.5, according to college football odds. The key number of seven can even be found in places. That line movement is contrary to what you would expect with this action, and a sign that smart money seems to be on the Trojans quite heavily. The totals line has opened at 60 and hasn’t shown early movement. Stanford is 9-1-1 ATS in their last 11 road games, and are 12-0-1 ATS in their last 13 games overall. USC has gone under the total in eight of their last 11 games. Stanford has covered five of the last seven meetings between these squads, and seven of the last nine meetings have gone over the spread. It’s a chalk pick, but I have to go with Stanford here. They have been so good and so dominant that they deserve my respect until they prove that they no longer deserve it. I really don’t like Notre Dame this year, so I devalue USC’s win last week, and that leaves them as an inconsistent and often underwhelming team. Stanford is stronger, deeper, and better coached, and they are going to be fired up for this game against a team that they take pride in beating. I like the Cardinal at 7.5, and would really like them at seven — though I am fairly confident that they won’t need that extra half point. Allen Eastman has been on fire with his college football picks, as he is 12-2-2 with his last 16 picks. That has been good for more than $2,000 in profits for $100 bettors and his college football handicapping has unearthed more solid picks for this weekend. Click Here for more info.